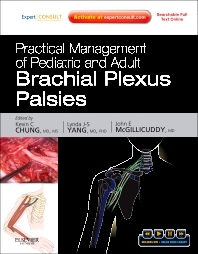 Practical Management of Pediatric and Adult Brachial Plexus Palsies covers in-depth surgical techniques for managing disorders of this crucial nerve complex so that you can most effectively treat injuries in patients of any age. Drs. Kevin Chung, Lynda Yan, and John McGillicuddy present a multidisciplinary approach to pediatric brachial plexus injury treatment and rehabilitation, obstetric considerations, and other hot topics in the field. With access to the full text and surgical videos online at expertconsult.com, you’ll have the dynamic, visual guidance you need to manage injuries to the brachial plexus. Access the fully searchable text online at www.expertconsult.com, along with surgical videos demonstrating how to perform key procedures. See cases as they present in practice through color illustrations, photos, and diagrams that highlight key anatomical structures and relationships. Apply multidisciplinary best practices with advice from internationally respected authorities in neurosurgery, orthopaedics, plastic surgery, and other relevant fields. Hone your technique with coverage that emphasizes optimizing outcomes with pearls and discussions of common pitfalls. Prepare for collaborating with other physicians thanks to a multidisciplinary approach that covers medical and legal aspects in addition to surgery. Find information quickly and easily with a full-color layout.